8:30am – Musher Meeting The First Baptist Church will also host the musher meeting at 8:30 a.m. The race starts and finishes at the First Baptist Church (195 North Billings) in Gwinn. 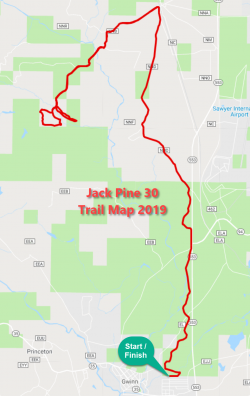 The race trail is approximately 25 miles. The trail follows snowmobile and woods trails to Sands Station (approx 8 miles). From Sands Station the trail turns Southwest for about 3 miles. Mushers will then run a beautiful 2.5-mile loop and return via the same trail to the finish. The few road crossings have many long-time volunteers assisting. Community members are invited to the First Baptist Church to meet the dogs and mushers and cheer as the teams blaze away from the starting gate. While the mushers are out on the trail, people can enjoy the shops and restaurants in Gwinn before heading for the finish line at the church. Mushers will meet after the race at Gwinn Baptist Church (finish line) where awards will be given for 1st through 10th place along with the commemorative Red Lantern Award for the musher who brings in the final team. The awards ceremony begins at 2:15pm (estimated) so there is plenty of time to take in the race start, spend time in Gwinn, view the finish and join the mushers and their handlers to celebrate this great winter event. Volunteers are needed at the church to help with musher parking and to get teams to the start line. Just because you don’t have a dog team doesn’t mean you can’t join the fun!